More 2010 Lightroom and Photoshop Workshops Posted! Lightroom Fundamentals Part Two: Sept 11-12. I will also be offering a 5-day Photoshop for Photographers workshop November 11-15. While Lightroom is a powerful tool, there are still many functions that photographers need that Photoshop is still best for. After mastering Photoshop basics, we move on to these specific areas. Click here for all course descriptions, prices and registration. I hope you can join me for one or more courses! I have finally set up a Facebook page. I see it not only as a way to let folks know that I have posted on my blog, but also a more casual forum for quick tips. I’d love to see you become a fan! Feel free to post ideas for blog posts, workshops, etc, or your latest Lightroom and Photoshop discoveries that you’d like to share. When you are done, deactivate the tool by hitting the Escape key. Curves is certainly not one of those intuitive features of Photoshop (or Lightroom), or at least that was my perspective when I tried to figure it out on my own before I got formal training. 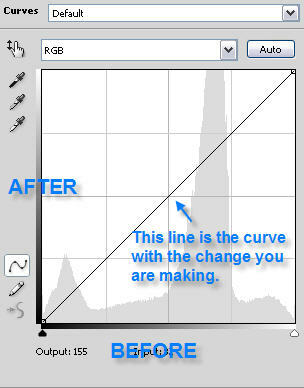 Curves is used to brighten or darken tones in your image, and at a more advanced level, to do color correction work. 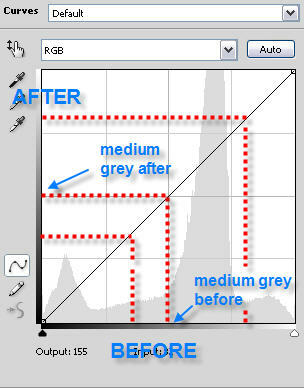 The best way to use it in PS is with an adjustment layer (Layer>New Adjustment Layer>Curves.) 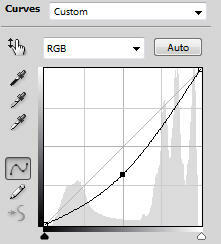 In Lightroom simply go to the Tone Curve panel in the Develop module. The curve will look like this (with different buttons and features around it depending on your software and version). Photoshop gives you more point-by-point control, so I will begin there. Of course in this case we haven’t moved the Curve, so there is no change from before to after, all tones are the same. The opposite would happen if you put a point in the middle and you dragged downward — you would darken all tones in the image except pure black and pure white, but the most darkening would be applied to the midtones. This technique to brighten or darken your image protects you from blowing out your highlights, or blocking up your shadows. 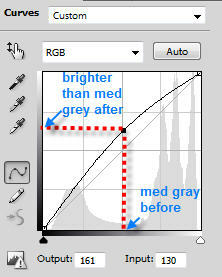 A point in the center moved up or down achieves the same effect as using the Brightness slider in LR or ACR. You can target the tones you want to affect and protect others — for example, in the following screen print, I brighten the lighter tones, and put two more points on the curve to prevent the midtones and darker tones from brightening as well. Be careful that you don’t make the curve too abrupt. 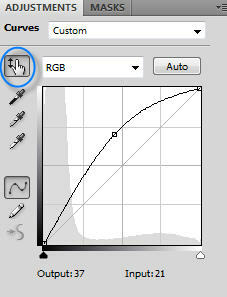 Hint: If you put a point on the curve that you want to delete, click on it and drag it off the chart. For contrast, points exactly on 1/4 and 3/4 tones, as I demonstrated above, give you the same result as you would get with the Contrast slider in Lightroom. With the curve though you can make a more conscious choice of which tones to focus on. 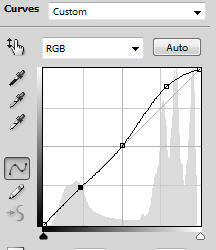 Lightroom also allows you to click and drag on the curve to bend it, though visually points aren’t laid down. However, you don’t get quite the same degree of fine control as you do in Photoshop. 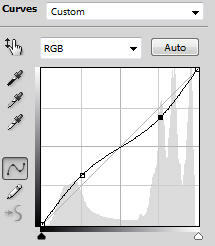 In a way, this is a good thing — Lightroom protects you from yourself by not allowing extreme (and therefore potentially disastrous) curves with many, many points or shifts in direction. 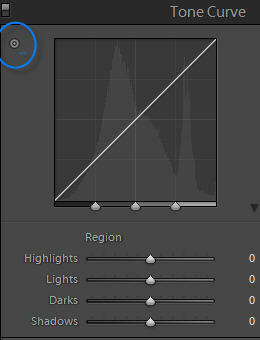 On the other hand, if you know what you’re doing with curves, and want that fine control, you will want to take your images from Lightroom into Photoshop to achieve it. 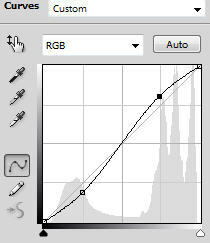 Lightroom also offers sliders below the tone curve. This is particularly handy for those who don’t understand the curve itself, but is also a convenience for all of us. 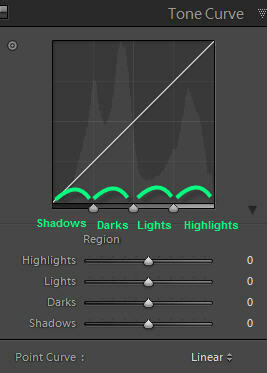 Highlights, Lights, Darks and Shadows by default each represent 25% of tones from black to white. In the same way you can redefine what tones Shadows, Lights and Darks cover. 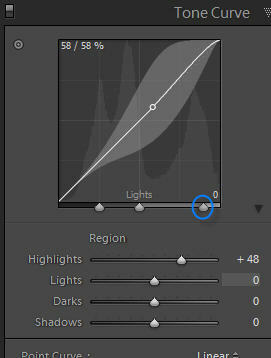 In Lightroom, I tend to use Brightness and Contrast in the Basics Panel to achieve overall midtone Brightness and Contrast, and then I move to the Tone Curve to finesse any specific tones that need attention — often I use it to dampen down my highlights, or to brighten up deep shadows. UPDATE MARCH 2010: The point curve, previously only available in ACR and Photoshop, has now been introduced in Lightroom 3 Beta 2. Click HERE for my post on how to access it. Do You Wonder What to Do to Make Your Images Really Stand Out? Most of us occasionally or often can use some advice about what we can do to make our images really pop. More contrast? Less contrast? Brighten up that corner? Change the color cast of just the mountain? It’s about conveying a mood, and understanding how to lead the viewer’s eye where you want them to go. If you have some favorite images and you want help from a master at this, consider doing what I just did — purchasing a Print Treatment critique from Tim Cooper. Tim is a very talented fine art photographer and photography and Photoshop instructor. For $25, you will receive a movie in which he works two of your images in Photoshop, talking about why he chooses to do what he does to your images, and showing you how it is done. It is a great deal, and really can help you learn how to take your images to the next level. Click HERE for more information (the Photo Critique tab, then scroll down to Print Treatment.) Also check out his new venture, Tim Cooper’s Photo Circle. I post this link particularly for RMSP students who took my compositing classes this summer. Enjoy! Want to remove telephone lines, whole buildings, or other objects from your photos? Adobe posted a video on Facebook today from Adobe Labs, demonstrating technology that they are working on for a future release of Photoshop. CS5 perhaps? Click here to go to video. Be sure to watch all the examples — it just keeps getting better! I have Lightroom. Do I need Photoshop? I have been meaning to write a post on this topic. However, I noticed today that my colleague Gene McCullagh has just written about this over on his blog, Lightroom Secrets. I agree with Gene that Lightroom will serve most photographers needs most of the time (and some photographers, all the time). My advice to serious amateurs and pro’s is to learn Lightroom very well, and only then, if you find you need more sophisticated pixel-editing tools, consider Photoshop (or even PS Elements) for just those advanced needs. I believe that today, with Lightroom so well established and powerful, educational programs that start photographers out in Photoshop rather than Lightroom are doing them a real disservice. I hope that programs that continue to take this outdated approach will catch up soon. Click here for Gene’s post. By the way, there is alot of great material on lightromsecrets.com … do check it out! Two factors determine how big your image will be when displayed — the size of your image in pixels, and how many pixels are displayed per inch, which is referred to as resolution. Both of the example images below have 6 pixels (3×2): the first is displayed at 1 pixel per inch, and the second is displayed at 2 pixels per inch. When you prepare your images for print, you specify what resolution your images will print at. If you have a 6 megapixel camera (i.e. 6 million pixel camera), your image is approximately 3,000 pixels wide by 2,000 pixels high (3,000 x 2,000 = 6 million). If you print this image (with no upsizing or downsizing) at 300 pixels per inch, your image will be 3,000/300 = 10″ wide, and 2,000/300 = 6.6″ high. If you print at 100 pixels per inch, your image will be 3,000/100 = 30″ wide, and 2,000/100=20″ high — much larger, but it will look less detailed because at this much lower resolution the individual square pixels are larger and more visible to the eye. I’ll get back to making my own tutorials and videos soon, but in the meantime, check out Adobe TV. Click here for Lightroom videos, and here for Photoshop videos. (They load in two stages, so give it a little time.) Check or uncheck the Release, Skill Level and Topic checkboxes on the right to narrow your selection. Enjoy!